The next big job we need to tackle is that of structuring the content of what will become your thesis and the best tool I found was the basic outline. In my experience, I found that the outline proved to be the SINGLE MOST IMPORTANT document I produced. Even more important than the thesis itself. The thesis would never have existed without the outline, because the outline is a tool for thinking about the content to come without even needing to really know the content specifics just yet. By definition, an outline is a list arranged to show hierarchical relationships. It is often used to present the main points or topics of a given subject and is often used as a rough draft or summary of the content of a document, in this case, your thesis. But for me, the outline was so much more than just a summary or hierarchical map of my thesis. It did eventually fill this role and became a planning tool for the actual content of my thesis. It was also a goal setting tool which I will talk more about in the “Managing Writing” section. It was also a tool that provided an overriding organizational function to the rest of the system. This will make more sense once we get talking about setting up Evernote in the next section. 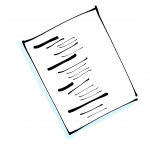 Before we really get into the specifics of your outline, it is important to state that your outline in a “LIVING DOCUMENT.” Your outline will be continuously revised, reorganized, updated, expanded, and refined as you go. It is not a document that you will do now, or in the next several weeks, then just put away. It will not be done until your thesis is nearly finished. Eventually, it will quite literally become the Table of Contents of your thesis document, but we will get there. Your Outline is a Communication Tool. Your outline is a communication tool first with yourself, with your own head. A recent version of your outline should never be very far from you. Your outline does not have to be particularly pretty or clean. It is a place to dump your ideas so that you do not lose them. If some notion pops into your head, dump it into your outline where ever it seems to fit at the moment. Write as little or as much as you need to capture the idea. A couple of lines and a reference or several paragraphs, that’s cool. Do not ever trust yourself to just remember all your ideas. Place them on your outline, let them percolate there. Maybe they will not become the full chapter you thought they might, but they could be several needed paragraphs. Or worst case scenario, the idea is not as solid as you thought at first and you end up deleting it later, but having it on your outline gives you a reason to think about it again, possibly deeper, and possibly leading to a better idea. No one is going to see your outline but you and a few people close to your thesis anyway, your thesis advisors. Let it be a tool for capturing your thinking, because it is the closest thing we have currently to a “Print Screen” button for our thoughts. Your outline is a communication tool between you and your thesis advisor(s). Every time you meet with them, have on hand the version of your outline that they last saw and your most recent version. This helps them see where your thinking is going and helps you remember everything that you want to bring them up to speed on. Talking about the changes you’ve made to your outline is one of the most effective ways I found to pull additional information out of your thesis advisors, who you have chosen because they are a wealth of relevant information and experiences. I found that sometimes all it took was bringing up some little notion I thought was relevant, placed on my outline, to be the catalyst my advisors need to be reminded of something they know about that was helpful. This is how you will get the most help from them. They will say things like, “Oh yeah… that makes sense. Have you read scholar X? Look up their paper on this, I think it was called ‘On really cool things you should know’ in the Harvard Business Review.” Or they will say “Point 4.2 there is a really interesting idea. I think you should dive more into that and scrap the stuff in point 4.3, which is far too controversial still and will take away from your intended goal.” Also, in discussing changes to your outline, they will say things like “It would probably be better to talk about this thing before that thing. It builds a stronger argument and you can then make this other connection to this third thing after that.” No problem. Awesome. Push a few lines of text around and your thesis just got better! And this is what I mean by the Outline being a Living Document. It will be changing constantly and will not be finished until just a little before your Thesis Document is. So obviously you need an outline, but how do you start?